April 23, 2016 By This post may contain affiliate links. 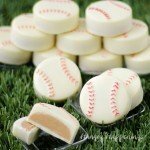 Baseball season is in full swing and I know your ball players will love these White Chocolate Baseballs filled with Peanut Butter Fudge. Each white chocolate candy coated fudge baseball is the perfect size treat for after a big game. They would also make wonderful treats to serve at a baseball themed party or to give dad on Father’s Day. Each candy is filled with the most decadently creamy peanut butter. It’s my favorite filling for any flavor of chocolate and pairs remarkably well with the white chocolate in these baseballs. Plus it’s really easy to make which was good because I needed to make a bunch of these candy baseballs. My sister asked me to make some fun baseball treats for my nephew’s baseball team. She was packing boxed lunches for all of the players and wanted to add something sweet. I had just purchased a baseball cookie mold and thought it would make the perfect sized treats. I could have gone the easy route and stuffed a cookie inside the white chocolate, but decided to fill them with peanut butter fudge instead. I knew the boys would love them, and they did. 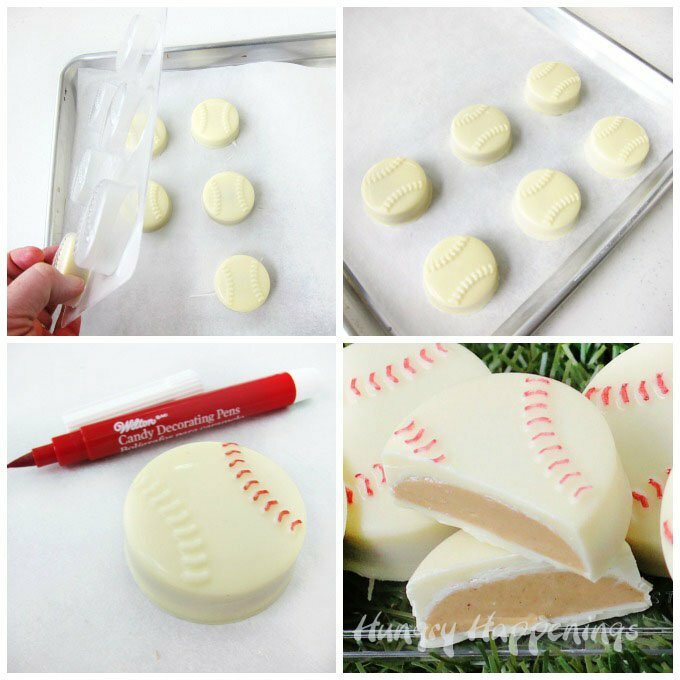 You can use the recipe and tutorial with any baseball candy mold that is large enough to hold some filling. The cookie molds, are 2 inches in diameter and 3/4 inches high. They are just thick enough to add a nice coating of white chocolate or white candy melts on the outside and have a nice 1/2 inch thick layer of peanut butter fudge in the center. 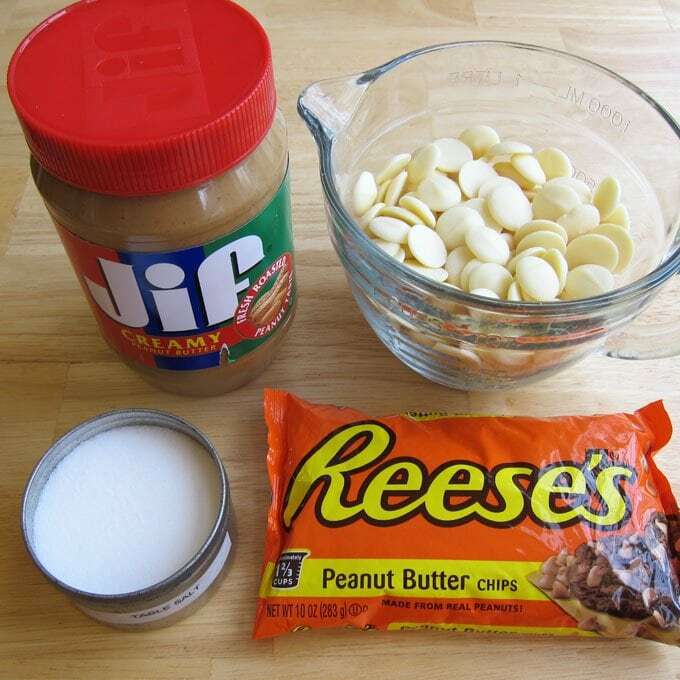 Combine the white confectionery coating (or chips) and the peanut butter chips in a microwave safe bowl. Heat on high power for 30 second increments, stirring after each until melted. Stir in peanut butter and pinch of salt until well combined. This peanut butter fudge is quite fluid when it’s first made but will firm up to the consistency of fudge once it cools completely, in about an hour. If, as you are working, it becomes too thick, simply reheat it in the microwave for 10-15 seconds. 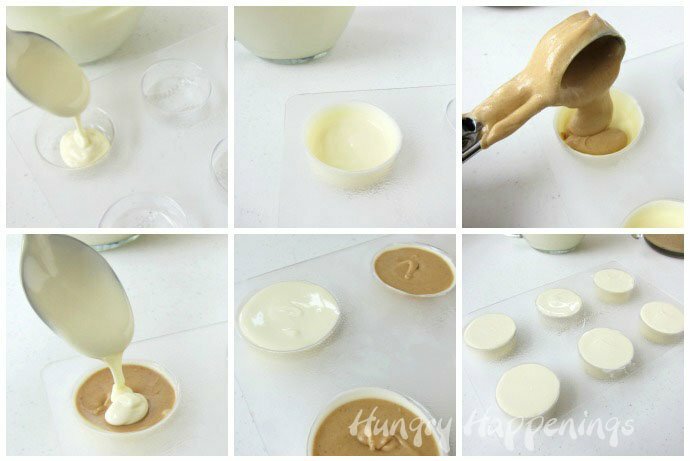 Just be sure that when you pour it into the white chocolate shells, that it’s not too hot or it will melt the white chocolate. Brush the white chocolate up the sides of the mold, creating just a thin shell. Pop the mold in the refrigerator (or freezer if using candy melts) for about 5 minutes until the chocolate hardens. Pour enough peanut butter fudge into the mold so you still have about 1/16th of an inch of room at the top. Pop the mold back in the refrigerator for 5-10 minutes until the fudge firms up on top. Remove the mold and let it sit at room temperature for 10 minutes before topping each candy with more white chocolate. Refrigerate again for about 5 minutes until that chocolate hardens. Pop the candies out of the mold and allow them to warm up to room temperature, about 15 minutes, before drawing on the red lines using a red Candy Decorating Pen. If you have trouble getting the food coloring marker to work well, be sure to check out my tips and tricks for working with edible markers. You can refill many of them or at least allow them to soak up more food coloring if they dry out. If you plan to package these white chocolate baseballs, be sure to allow the red food coloring to dry before doing so. 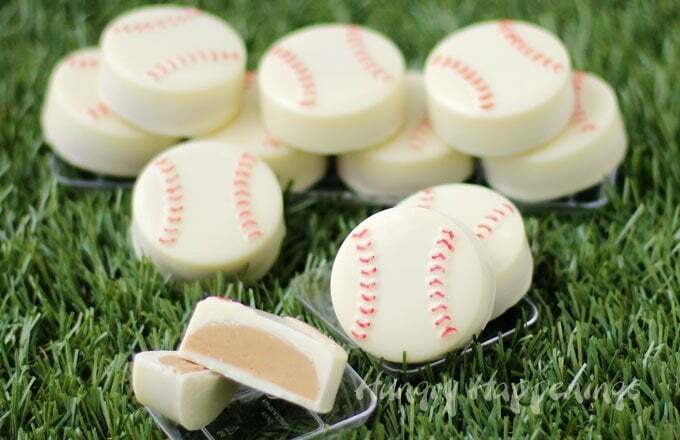 Peanut butter fudge filled white chocolate candies that are decorated to look like baseballs. They're perfect for a baseball themed party or a sports themed birthday party! Combine white confectionery coating and peanut butter chips in a microwave safe bowl. Allow to cool slightly before pouring into your white chocolate shells. Spoon about a tablespoon of white chocolate into each baseball mold and brush it up the sides. Refrigerate (or freeze if using candy melts) for about 5 minutes until it sets. Fill each mold with fudge and chill until set. Top with a thin coating of white chocolate and chill until set. Draw on details using a red food coloring marker. These are awesome Beth! I’m so glad I stopped by Hungry Happenings today! Hubby-aka Pawpaw-and I just returned from one of our grandson’s baseball games. With only four more to go, the end of the season party is coming up soon. These so cute baseball treats would be so much fun to give to the kiddos and I sure do LOVE peanut butter fudge! I’m happy you stopped by too! 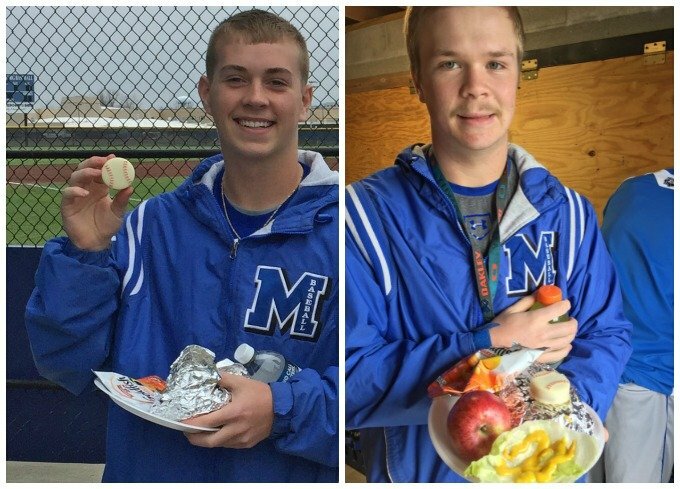 My nephew and his friends really loved snacking on these peanut butter fudge filled baseballs. 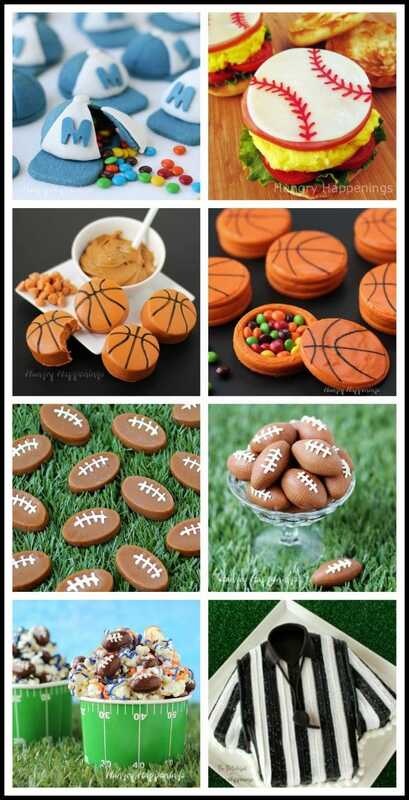 They are the perfect size treat for after or before a big game. I hope your grandson enjoys them too!